Before you set up a Roku device to stream any of the 5000+ streaming channels available, it needs to be connected to the internet. 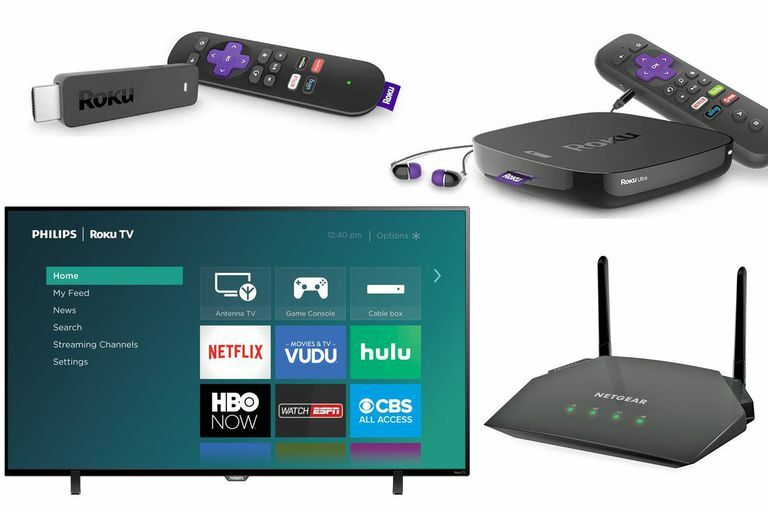 Roku boxes and TVs allow you to connect to the internet via Ethernet or Wi-Fi, while Streaming Sticks provide only the Wi-Fi option. A Router that has both Wired and Wireless connectivity options. Just in case the Wi-Fi option doesn't work for a Roku box or TV, you may need to make the connection to your router via Ethernet Cable. Once you have your Roku device connected to power and powered on, you'll be guided through a setup process which includes connecting the device to the internet. During setup for Roku boxes and TVs, you'll be prompted to choose Wired or Wireless. The Wired option will not appear on Roku Streaming Sticks. If you select Wired, don't forget to connect your Roku box or TV to your router using an Ethernet cable. Your Roku device will directly connect to your home network and the internet. Once confirmed, you can continue with the remaining setup steps for your Roku device. If you select Wireless, there are additional steps to complete the connection process. For a first time setup, your Roku device will automatically scan for any available networks within range. Once the list of available networks appears, choose your wireless network from the list of those available. If you do not see your home network, select Scan again to see all networks. If the Roku device cannot find your network, the Roku and router may be too far apart. If you have the option of connecting to your router using ethernet, that is one solution. Another is to move the Roku device and router closer together or add a wireless range extender. Once Roku confirms it can connect to your network, you need to enter your network password. Once you enter your password, select Connect. If the password was entered correctly, you'll see a confirmation stating your Roku device has connected to your home network and the internet. Once connected, your Roku device will automatically search for any available firmware/software updates, then download and install them. Your Roku device may reboot/restart at the end of the software/firmware update process. Wait for this process to finish before moving on to additional setup steps or viewing. Select Wireless (if both the Wired and Wireless options are shown). Wait for Roku to find your network. Enter your network password and wait for connection confirmation. One great feature of Roku is you can travel with your streaming stick or box and use it in a dorm room or Hotel. Before you pack your Roku for use in another location, make sure the location provides Wi-Fi and the TV you'll be using has an available HDMI connection you can access from the TV's remote control. Make sure to have your Roku Account log-in information, just in case you need it. Obtain the location's network password. Plug in your Roku stick or box to power and the TV you want to use. Go to Settings > Network > Set Up Connection. Once you establish the network connection, select I am at a hotel or college dorm. Several prompts will appear on the TV screen for authentication purposes, such as entering the Wi-Fi password you obtained earlier, as well as a specific password that will grant access to the Roku server. This password will be shown on the screen. The latter password may require a smartphone, tablet, or laptop. Once the Wi-Fi setup is confirmed, you can enjoy your Roku device's features and your favorite streaming content.